From Chapter 10: 1975 was the year Bruce Springsteen broke through, with his third album Born to Run, released in September. The media were all over him: there was a rave review in Rolling Stone and those infamous Time/Newsweek covers in October. The title song makes its appearance in Cusp on Thanksgiving 1975. During some very fraught meal prep, it plays on the kitchen radio. (Every kitchen had a radio back then, for news, Top 40 and snow days.) Karen's mother has invited her ex over for Thanksgiving dinner, even though their recent divorce is still a gaping wound. Karen thinks this is a terrible idea and, to a soundtrack of Bruce, tells her mother so. 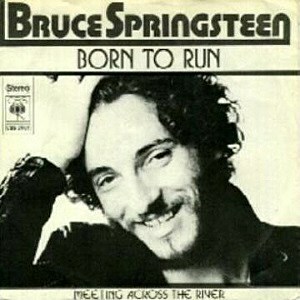 "Born to Run" is a dramatic anthem of adolescence: Cars as suicide machines. Being sprung from cages, breaking from traps. Getting out while we're young and never going back. Finding out how it all feels. If you'll pardon the expression, it's about being on the cusp of everything: craving independence, breaking the bonds of family and hometown to make a mark in the greater world and experience freedom and passion. Hell, that STILL sounds good to me! It's about the only song that I know ALL the words to.